Railpictures.ca - Bill McArthur photo, Dan Dell'Unto coll. Photo: There’s lots of photos of GO power running on CN and CP in freight service, but what about the opposite – CN power in GO service? In the 1970′s CN had two of their GP40′s, 4016 and 4017 (later renumbered 9316 & 9317 in 1981) equipped with high-speed 89mph gearing for CN and later VIA passenger service in the southern Ontario corridor, pulling both conventional steam-heated and Tempo consists (usually with an SGU car or HEP-equipped baggage) and often mixed in with the usual passenger pool power out of Spadina roundhouse. They did however see the occasional fling in GO service: they operated for a time in the early 1970′s with CN SGU cars and leased Ontario Northland coaches working in GO service on the Lakeshore corridor. The Spring/Summer of 1982 was another time when the CN GP40 duo regularly showed up in GO Transit service, usually doubleheading behind a 700-series GP40-2W on a Lakeshore line train. Here we see GO 700 and CN 9317 teamed up pushing a consist from Hamilton, trailing 10 bilevels and an APCU heading eastbound through Bayview on the CN Oakville Sub. 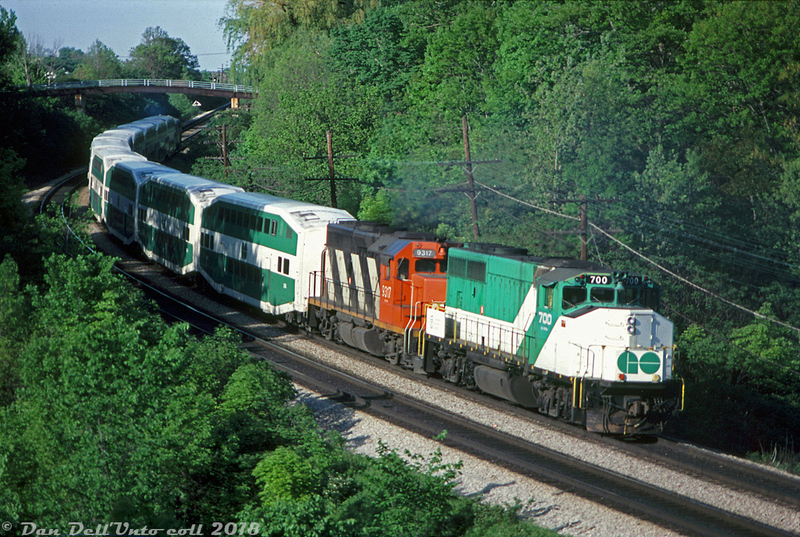 Photos suggest 9316, 9317 and also 9312 saw use on GO trains during this time (the rest of the 9300′s were never regeared and never saw regular passenger train use. It’s also questionable if 9312 was regeared for GO, or just pressed into service as-is. Anyone? Bueller? Bueller?). The aging CN 9300′s would run out their careers in freight service in the 1990′s and get sold off, but not before being joined in freight service by GO’s entire fleet of GP40-2W’s (minus 703), sold to CN in 1991 and renumbered as high 9600′s. They also initially keeping their own high-speed gearing as well. Bill McArthur photo, Dan Dell’Unto collection scan. | Railpictures.ca – Canadian Railway Photography – photographie ferroviaire Canadienne. Caption: There's lots of photos of GO power running on CN and CP in freight service, but what about the opposite - CN power in GO service? In the 1970's CN had two of their GP40's, 4016 and 4017 (later renumbered 9316 & 9317 in 1981) equipped with high-speed 89mph gearing for CN and later VIA passenger service in the southern Ontario corridor, pulling both conventional steam-heated and Tempo consists (usually with an SGU car or HEP-equipped baggage) and often mixed in with the usual passenger pool power out of Spadina roundhouse. They did however see the occasional fling in GO service: they operated for a time in the early 1970's with CN SGU cars and leased Ontario Northland coaches working in GO service on the Lakeshore corridor. The Spring/Summer of 1982 was another time when the CN GP40 duo regularly showed up in GO Transit service, usually doubleheading behind a 700-series GP40-2W on a Lakeshore line train. Here we see GO 700 and CN 9317 teamed up pushing a consist from Hamilton, trailing 10 bilevels and an APCU heading eastbound through Bayview on the CN Oakville Sub. Photos suggest 9316, 9317 and also 9312 saw use on GO trains during this time (the rest of the 9300's were never regeared and never saw regular passenger train use. It's also questionable if 9312 was regeared for GO, or just pressed into service as-is. Anyone? Bueller? Bueller?). The aging CN 9300's would run out their careers in freight service in the 1990's and get sold off, but not before being joined in freight service by GO's entire fleet of GP40-2W's (minus 703), sold to CN in 1991 and renumbered as high 9600's. They also initially keeping their own high-speed gearing as well. Bill McArthur photo, Dan Dell'Unto collection scan. Colm, 703 went to Tri-Rail with GO APCU 904. Where did 703 go? Curious because I have a model of it. Looks like one of those slides from his personal “Keepers”. Very nice. This is excellent, Dan. 9316 and 9317 certainly put their passenger gearing to good use.